Waller shares his techniques for swinging wets & waking dry flies, including proper approach, presentation, & his favorite fly patterns, both classic & contemporary. Covers: hunting trophies, equip, casting, & conservation. Provides readers with a life's worth of wisdom learned from Waller's time on the water. 189 color photos by Ken Morrish, 10 color illus; 8.5x11 inches, 216 pgs. Waller brings along some of his friends to help contribute to the book. Steelhead expert Bob Hooton's chapter on steelhead biology is a concise overview of the steelhead's life cycle, biology, and behavior; artist Dave Hall illustrates Waller's swinging techniques; and photographer Ken Morrish's stunning images capture the magic of the fish and the rivers they ascend each year. 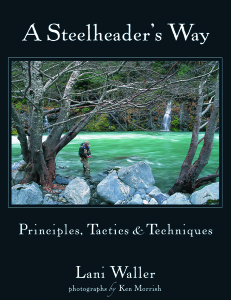 This all-star cast of steelhead fanatics has created a classic book that honors the fish as well as those who chase them, whether in the Pacific Northwest of United States, the wilderness streams of British Columbia, or the hundreds of tributaries that run into the Great Lakes.